Vraska is sick of sticking to the shadows. As a gorgon and an assassin who specializes in covert killing, she certainly doesn't crave the spotlight. But she is ready to gain recognition for herself and her compatriots in the Golgari Swarm, and she has finally found a way to do it: a mission for "Lord Nicolas" on the remote plane of Ixalan. Today, we'll take a look back at who Vraska is and how she found herself here, in the service of one of the Multiverse's most notorious villains. 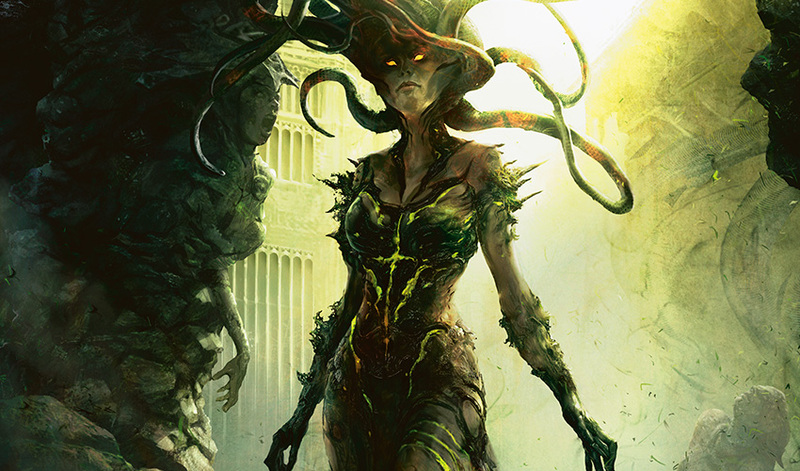 Vraska was born to the Golgari guild on Ravnica, a loose federation of necromancers, rot farmers, insect-people, gorgons, and other outcasts who live in the Undercity beneath the streets. In theory, the swarm is united beneath the rule of the lich lord Jarad, an undead elf who has ruled the guild for decades. In practice, there are many factions among the Golgari, and Jarad has not hesitated to elevate some above others. Gorgons occupy a strange place in the Golgari hierarchy. They are fearsome warriors by any measure, and for a time the guild was ruled by a trio of gorgon siblings, the Sisters of Stone Death. But even within the Golgari, there are many who fear gorgons—not only for their fabled ability to turn their enemies to stone, but for the skill and knowledge they build over the course of their long lives. In Jarad's Golgari Swarm, the gorgons are treated like weapons, to be unleashed upon the enemy when needed and kept safely out of sight otherwise. This never sat well with Vraska. Even before she became a Planeswalker, she dreamed of upending the Golgari social order and gaining equality—or better—for her people and others marginalized by Jarad. As told in "The Shadows of Prahv, Part 1"
Vraska's life changed forever when she and hundreds of other Golgari were swept up in a massive raid on the Undercity by the Azorius Senate. Mistreated and under light guard, her fellow prisoners revolted. Vraska fought viciously during the revolt, but ultimately over a hundred of her guildmates were illegally killed while in Azorius custody. Officially, Vraska herself was counted among the deceased, although her body was never found. The reality was far stranger: Vraska's Planeswalker spark had ignited, transporting her out of her desperate situation, to another world she could never have imagined. Like most initial planeswalks, Vraska's initial trip was involuntary, a reflex that transported her elsewhere in the Multiverse. Unfortunately, Vraska's first planeswalk was not a pleasant one. She found herself trapped in an underground chamber with no way out, unable to escape by any physical means. Only after she intuited how to planeswalk intentionally did she make her way back to Ravnica and the Golgari, forever changed by the experience. As told in "The Shadows of Prahv, Part 2"
Vraska's talents were uniquely suited to killing. She soon joined an assassin's guild, the Ochran, on Ravnica, eventually rising in the group's ranks. Killing was never personal to her, and she never delighted in the act of murder—it was just a job—but she did delight in delivering comeuppance to those who subjugated others. Vraska cares a great deal for those she sees as outcasts like herself and goes out of her way to befriend the various weirdos and monsters of the Multiverse. She likes to travel and explore and enjoys taking home trinkets from the various places she visits. Sometimes those trinkets are the petrified pieces of particularly awful people. There was one ongoing project to which she devoted considerable time and resources: revenge on those who participated in the raid of Golgari territory that caused her spark to ignite and killed so many of her fellow Golgari. She tracked down the officers on duty during the riot, those who had participated in the sweep, and the arbiters who had authorized the raid. One by one, she killed them, each one in a method suitable to their particular vices and character flaws. One of them loved attention, so she hung him in the public square. The last of them, an arbiter named Relov, was guilty mainly of apathy, signing orders without caring what they were for. She petrified him and tricked the Azorius into installing him as a statue, forever still and uncaring. Vengeance brought Vraska no joy, but it did at least bring her some closure. As told in "The Gorgon and the Guildpact"
Several years back, the Planeswalker Jace Beleren became Ravnica's Living Guildpact, an embodiment of the laws that keep Ravnica's guilds in a fragile state of peace. This didn't sit well with a lot of people, but it was particularly unwelcome to Vraska. As a Planeswalker herself, she quickly became aware of Jace's nature, and she instantly resented him. He wasn't even from Ravnica, and he thought he could keep it safe. Over a year ago, Vraska lured Jace to a secret meeting. Her goal was to either find a way to work with him to overthrow the guilds or, failing that, to kill him. In the end, she did neither, and Jace extracted a confession of sorts that he broadcast to a group of assembled guild representatives. This exposure was enough to drive Vraska into the shadows for quite some time. But her pride and ambition would not be denied forever. 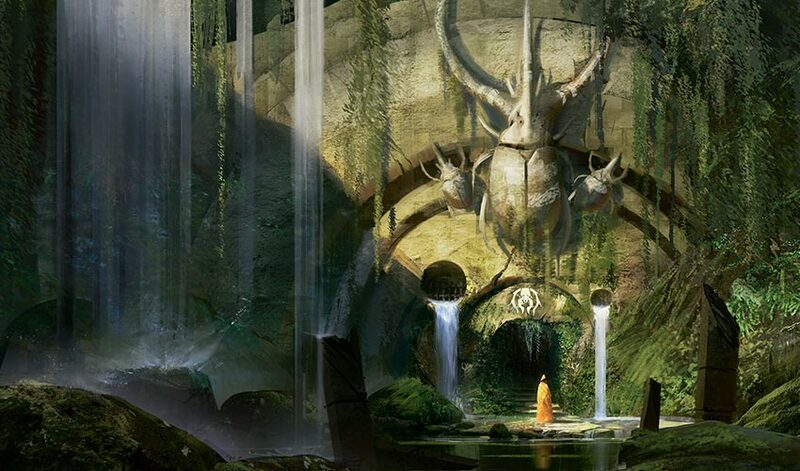 Vraska's ambitions soon caught the attention of the dragon Planeswalker Nicol Bolas, who invited her to meet with him in his Meditation Realm, an artificial plane that serves as his base of operations. Bolas offered Vraska a simple deal—she would go to Ixalan and retrieve an item for him, and in return he would make her the guildmaster of the Golgari. The catch: until she completed this task, she would be unable to leave Ixalan. Although she didn't entirely trust the dragon, Vraska agreed to his terms. The chance to lead the Golgari was too good to pass up. At last, those on the fringes of the guild could come in from the cold. More importantly, under Vraska's leadership, the Golgari themselves—long relegated to Ravnica's fetid Undercity—could finally claim their place in Ravnican society. As told in "Pride of the Kraul"
Over the years, Vraska made many contacts and friends among the disaffected outcasts of the Golgari. One of them was Mazirek, a death priest of the insectoid, hive-dwelling kraul. One of Vraska's last stops before her departure to Ixalan was a meeting with Mazirek to set things in motion on Ravnica while she was gone. 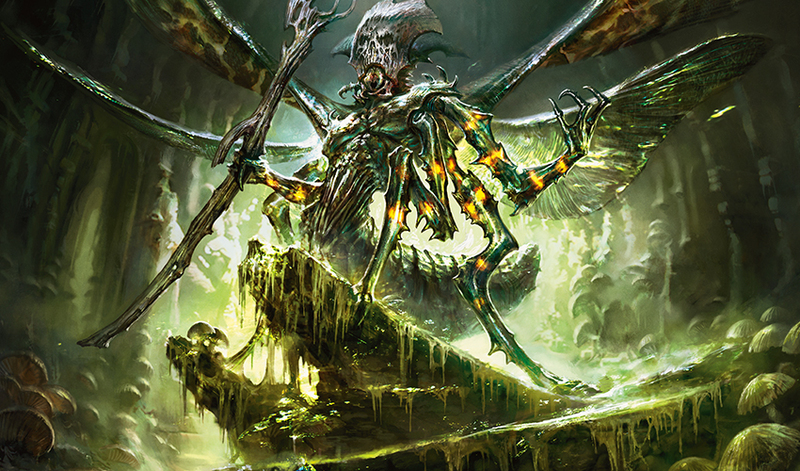 With Vraska's guidance, Mazirek entered a secret mausoleum and awakened an army of long-lost undead soldiers called the Erstwhile. It remains to be seen what Mazirek—or Vraska, when she returns—will do with this new force. 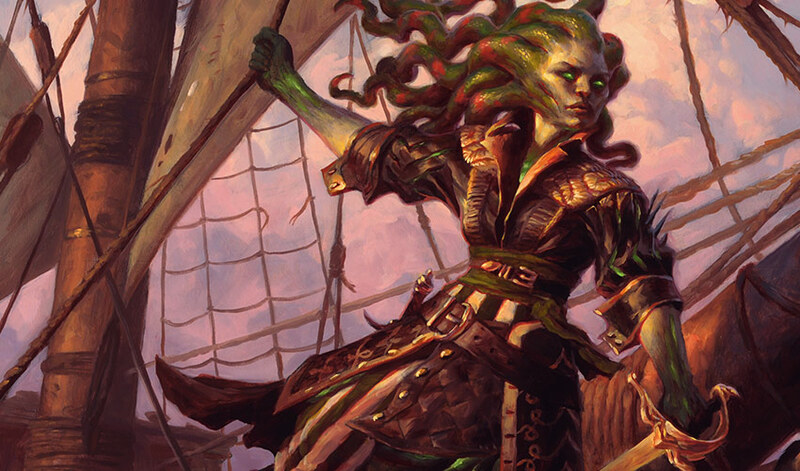 As told in "The Talented Captain Vraska"
Armed with a thaumatic compass and an artificially implanted knowledge of sailing, Vraska arrived on Ixalan. She petrified a pirate captain, took over his ship, and set sail, with only the compass to guide her. Vraska sees her crew on Ixalan as her family—fellow outcasts like herself. She is a very democratic leader, which earns a great deal of respect and admiration from her crew. She would never double-cross them, and would always be plainspoken about the dangers they would face. She isn't a liar, but she is willing to cut off a deal when she knows it's a bad one. Recently, Vraska rescued none other than Jace Beleren from an island on Ixalan, finding that he had no memory of his former life. Although suspicious at first, she eventually concluded that this new Jace would prove a far better ally than the old one.